Join the makers of the award-winning feature-length documentary film WALKING WHILE BLACK: L.O.V.E. Is The Answer in bridging the divide between police and the community. Participate in the L.O.V.E. Is The Answer 5-Minute Film Contest, pairing teens with peace officers to create short films showing L.O.V.E. being put into action in the community. 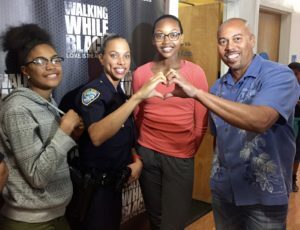 Visit www.walkingwhileblackthemovie.com to see the film that is repairing relationships between peace officers and the communities they serve. After you’ve seen the WALKING WHILE BLACK film, now make your own 5-minute film putting the L.O.V.E. principles into action! Each team must be co-led by a young person between the ages of 13 and 23, and a peace officer. Anyone else can sign up to join a team. Each team must also have a Manager 18 or older, and that person handles all of the administrative duties, like signing a team up here to compete in the contest.